The NASC’s widely respected NASC 2017 Yearbook has launched – including confirmation of the highest level of NASC membership, since formation in 1945. The Yearbook is packed with almost 100 pages of the latest UK scaffolding news, updates on new and revised NASC guidance, CISRS training and Britain’s premier access and scaffolding projects, as well as details of the activities of the confederation in 2016. 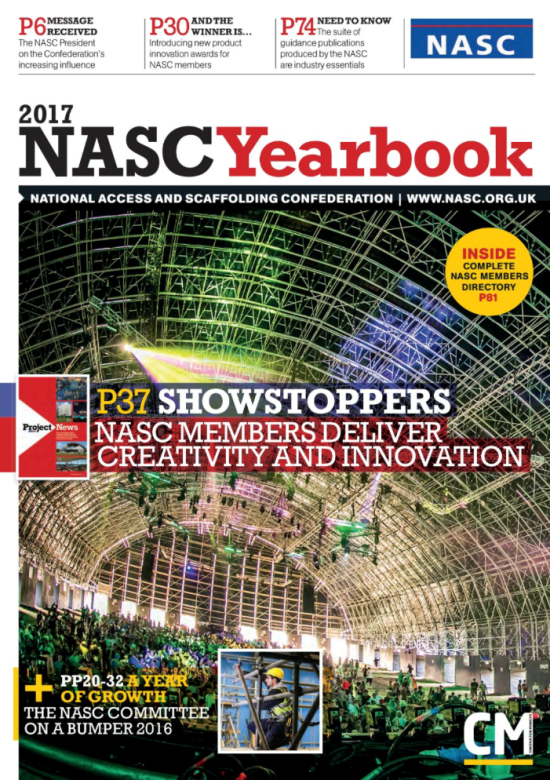 NASC Managing Director Robin James opens the popular publication with a welcome stating: “It’s boom time for the NASC and its members – as membership enquiries and applications peaked, sales of TG20:13 soared and the value of NASC membership reached scaffolding companies of all sizes in 2016. The NASC 2017 Yearbook contains details of prestige projects from NASC members, showcasing scaffolding expertise, with examples of leading access and scaffolding jobs from across the UK – including the Battersea Power Station renovation project by QFS scaffolding, Carlisle Railway Station works by XERVON Palmers, Creamfields Steelyard by Acorn Scaffolding and the National Trust’s Clandon Park renovation after its fire, by Ideal Scaffolding (Southern), to name just a few. Audit and Membership report by outgoing Audit Committee Chair and current NASC President, Alan Lilley. Access and Scaffolding Industry Training Organisation Committee report, by ASITO Chair, Mike Burr. Technical Committee report by Chair, James Attridge. Contractual Committee report by Committee Chair, David Brown. Further sections include information about the confederation and who’s who in the organisation, how to become an NASC member/membership criteria, a list of current NASC publications, the NASC Code of Conduct, membership benefits and an A-Z of all NASC Full Contracting, Hire & Sales and Information members. The NASC 2017 Yearbook has been designed, edited and printed by Construction Manager publishers Atom (as per 2015 and 2016) and is being distributed to 30,000+ industry professionals and members of the Chartered Institute of Building (CIOB) in the November/December issue of Construction Manager magazine, on November 5th. In addition to the 96 page printed version, an e-reader version of the NASC 2017 Yearbook is available to view here and via the NASC website ‘About’ page.